Emerald is the beautiful birthstone of May. It is a well known, popular and classic gemstone that has been used in jewellery making for centuries. Emerald is said to be the stone of infinite patience as well as the "stone of successful love". 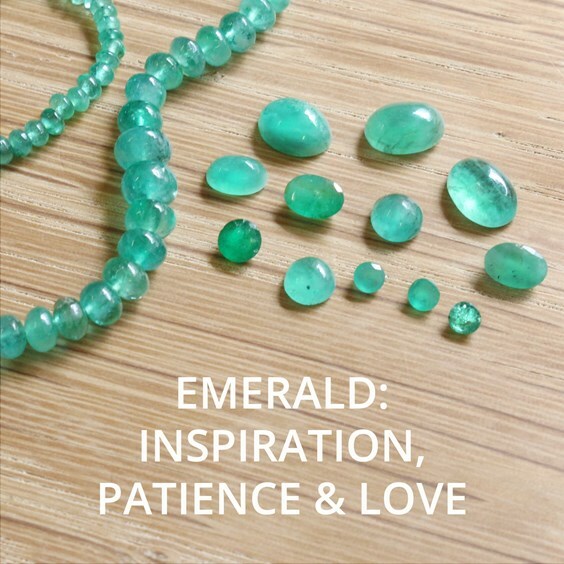 We stock a variety of emerald stones at Kernowcraft including faceted stones, cabohcons and beautiful rondelle beads, so as it is the emerald month of May we thought we would celebrate this stunning, precious stone with a blog post all about its history and spiritual properties as well as some emerald jewellery making inspiration. Colour: Emerald is found in a small variety of deep velvety shades of green - the colour "Emerald Green" being named after the gemstone. The most valuable colour of emerald is the deeper shade of green which can be hard to come across in a size worth cutting. The colour of emeralds is not normally effected by light and does not alter over time as some other gemstones can. Appearance: Emerald is often found with inclusions caused by gas bubbles, liquid, healing cracks and foreign crystals. It is rare to find flawless emeralds however it's flaws can be invaluable in distinguishing the real stone form synthetic imitations. Rarity: Emeralds are not considered a rare stone however finding the clearest stones can be a challenge. MOH Scale Hardness: Emerald is part of the Beryl family, it measures 7.5 - 8 on the MOH scale making it one of the tougher gemstones. Sourced: Emeralds are sourced in Columbia, Austria, India, Australia, Brazil, South Africa, Egypt, USA, Norway, Pakistan and Zimbabwe. The finest Emeralds are currently found in Columbia where they occur in veins within dark shales and limestones. Emerald is formed by rising magma and metamorphism. Mining is nearly exclusively from host rock where the emerald has grown into small veins or on walls of cavities. 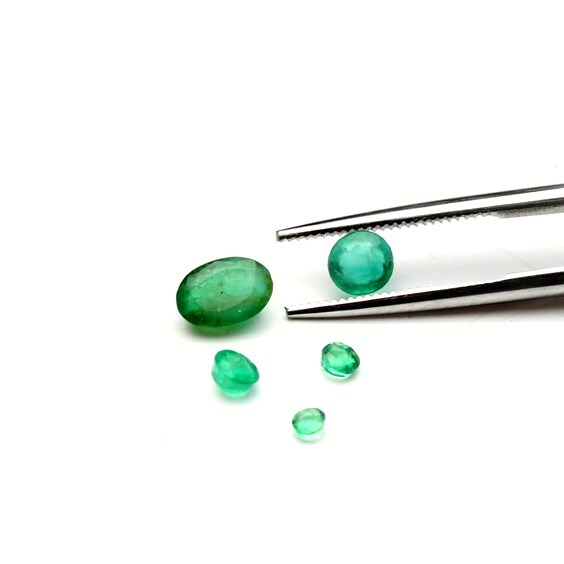 The oldest known emeralds were found near the Red Sea in Egypt. However, gemstone mines that had already been exploited by Egyptian pharaohs between 3000 and 1500 B.C. - known as 'Cleopatra's Mines', had already been exhausted by the time they were rediscovered in the early 19th century. The Vedas which is the holy scriptures of the Indians, talk of a precious green gem and its healing properties. They believed emeralds promised good luck and enhances well-being. The treasure chests of Indian maharajas and maharanis have been found containing wonderful emeralds. The name emerald comes from the Greek 'smaragdos' via the Old French 'esmeralde' which means 'green gemstone'. There are many well-known large emeralds as famous as diamonds and rubies. Many beautiful pieces of serval carats are kept by British Museum of Natural History in London and the American Museum of Natural History in New York. Emeralds have been a spiritual stone throughout history. Semi Devine Egyptian magician Hermes Trismegistos created the legendary Emerald Tablet in which he engraved all of the secrets of magic and alchemy. Emerald is said to be the stone of infinite patience. It is thought to be a 'life-affirming' stone with great integrity. Known as the "stone of successful love", it brings domestic bliss and loyalty as well as unconditional love and partnership. Emerald is also said to have the ability to sharpen the wits, confer riches and power as well as to predict future events. It is also said to strengthen the memory. 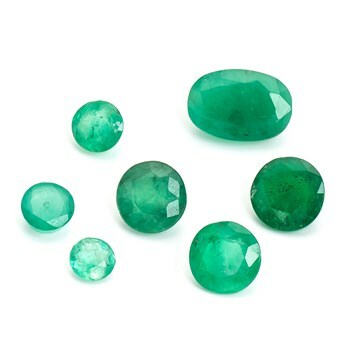 Emerald is thought to protect women against domestic abuse or violence. In the workplace it is said to strengthen women and help them to overcome sexism. Wear an Emerald out of sight and near the heart to attract love (especially in older women) or wear an Emerald openly for healing a relationship after a separation or infidelity. Wipe emeralds with a soft cloth and recharge the powers within this stone by the waxing moon. 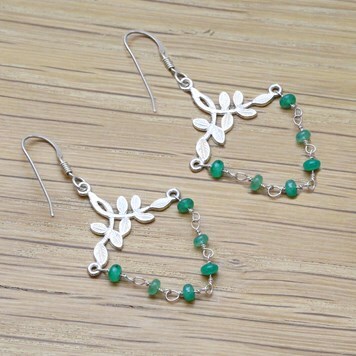 Emeralds are regularly used in crystal healing. They were said to assist with eye infections as the soothing green colour of the emerald was thought to be restful to the eyes when they had been under much strain. Conditions linked to the heart, lungs, pancreas and lymph nodes are also said to be helped by emerald. The emerald was also used as an antidote for poisons and infected wounds, as well as against possession by demons. It is said to increase inner radiance and preserve youthfulness, helping older women through menopause. Emeralds have been used in jewellery making for centuries. It is a strong stone with a beautiful vivid and natural colour which makes it very popular. 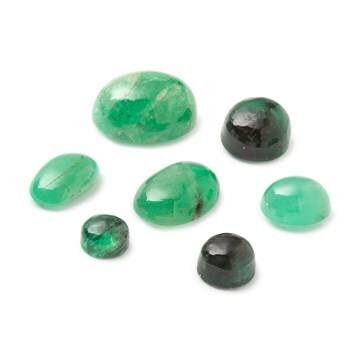 Below is a selection of our emerald products and some design ideas for incorporating them. The wonderful colour of these gorgeous beads are really set off against gold beads and findings for a touch of luxury. 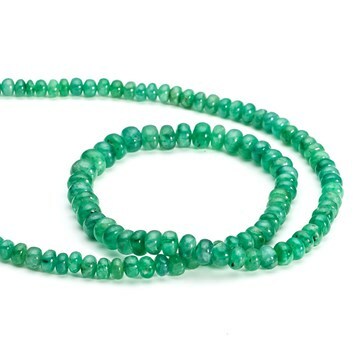 These emerald rondelles are temporarily strung and graduated so when buying loose beads you will receive a good mix of sizes. If you would like some to match let us know and we'll do our best to match them for you. A beautiful and simple necklace design is to create a bar of beads that graduate from small to large to small again like this jewellery making project in our Make The Look category. These beautiful grassy green gems vary from clear to cloudy. Emeralds are rarely flawless and the inclusions only add to the character of each stone. Use our Snaptite settings to easily set these gorgeous stones and incorporate them into your designs. 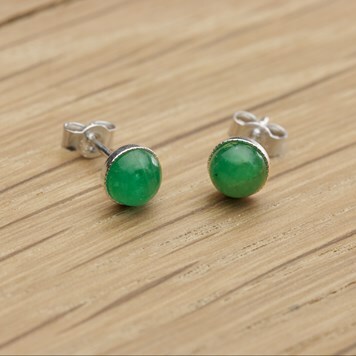 Or for some quick and easy yet beautiful sterling silver emerald earstuds try our snaptite earstuds. These emerald gemstone cabochons look beautiful simply set in our sterling silver plain edge bezel cups and incorporated into designs such as a sterling silver ring. If you are new to jewellery making we have numerous ring settings that can help you to create a high quality ring with no soldering involved. Click here to view our ring settings and don't forget to ensure the setting size matches the size of the stone you have picked. Information Sources For This Blog.